Midnight in the Heart of Midlothian is a short story written by Frank O'Connor, which is featured in the book Halo: Evolutions - Essential Tales of the Halo Universe. It follows the story of an Orbital Drop Shock Trooper named Michael Baird in battle aboard the ship UNSC The Heart of Midlothian, with the help of the AI Mo Ye. The story takes places shortly after the Halo Legends short film Prototype; the beginning of the motion comic adaptation even depicts the battle featured in the short film. The story was adapted to motion comic format by ONE and published on Halo Waypoint. UNSC The Heart of Midlothian entering Slipspace. The story starts aboard the UNSC The Heart of Midlothian with ODST Sergeant Michael Baird being told he has cancer. The ship's medical technician tells Michael that his disease is easily treatable and that the procedure will take about an hour. The operation begins with the ship's AI Mo Ye watching over him. While Baird is asleep, the ship is ambushed by a small Covenant fleet just after it drops out of slipspace, and the surprised crew are overwhelmed by the boarding parties. As Mo Ye tells Baird about the events that occurred while he was unconscious, he asks why she cannot just wipe the NAV database, as per the Cole Protocol. She tells Baird that this boarding party was unlike any other, as they systematically separated Mo Ye from these essential systems to prevent her from doing so. She also reveals that they had brought aboard a never before encountered Covenant species. In order for Mo Ye to start the self-destruct sequence, Baird needs to travel to the bridge and manually boot her systems. She is able to tell him this because she had left a small piece of her coding behind to watch over Baird's procedure. In addition, while she is limited to this piece of coding, she is physically incapable of doing anything that will harm a human due to Asimov's First Law of Robotics; as a result, she can not self-destruct the ship either, as this would lead to the death of Baird. Armed only with a fire extinguisher, Baird sets out for the control room to manually destroy the database, but encounters a small group of Covenant, consisting of four Unggoy, two Kig-Yar, and one Sangheili. He snaps the first Kig-Yar's neck by smashing its head with the fire extinguisher. He then uses the fallen Kig-Yar's Covenant Carbine to take out the next. As the Unggoy begin to disperse in fear, one accidentally runs into him. As they look at each other, Baird notices an energy sword running through the cowering Unggoy and himself. 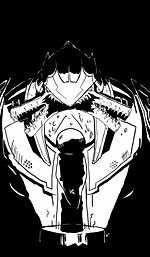 He looks up and realizes the leading Sangheili has stabbed him with his sword. As the Sangheili pulls away, the Unggoy falls dead and Baird loses consciousness. Baird is awoken again by Mo Ye, who leads him to a medical cabinet containing "Rumbledrugs", known to be used by Insurrectionists when fighting SPARTANs. It is known as a suicide drug, slowly destroying the body, but temporarily making it totally impervious to pain and capable of amazing feats of strength. Using these drugs, Baird, with about an hour to live before the medicines kill him, makes his way to the control room, where he encounters more of the boarding party, including the leader, who is the same Sangheili who had stabbed him. Baird drops his weapons and says he will give them the coordinates of Earth if they let him escape. As the Covenant begin to raise their weapons at him, the Sangheili roars at them to stop and communicates with the Huragok onboard. The Sangheili then agrees to let Baird do what he asked to do. Instead of giving the coordinates to the boarding party, Baird reconnects Mo Ye to the ship's systems. Despite the AI's restored access to the ship, she notifies him that she still cannot circumvent Asimov's First Law in her current state. Baird then punches the Sangheili as hard as he can, breaking his hand and the alien's jaw. He begins to taunt the Sangheili, who responds by beheading Baird with its energy sword. With no humans left alive onboard the ship, Mo Ye is no longer bound by Asimov's Three Laws and proceeds to self-destruct the ship. After initiating a fake countdown, causing the Sangheili commander to order a retreat, Mo Ye tells him that there is no need for any countdown whatsoever. She promptly detonates the destroyer's nuclear charges, destroying the entire ship. The inferno also engulfs the Covenant ships that had ambushed the destroyer, leaving only debris in its wake. The story is similar to that of the original Marathon, as the protagonist is the last human survivor aboard a ship and is helped by an AI who can only open doors. In Marathon, the AI is Leela, and in Midnight in the Heart of Midlothian, it is Mo Ye. In the motion comic adaptation of the story, Baird was voiced by Leonard Meyer and Mo Ye was voiced by Mona Marshall. The medical technician was voiced by Frank O'Connor, the author of the story and 343 Industries' Franchise Development Director. "Heart of Midlothian" is the name of Frank O'Connor's favorite association football team, based in the Gorgie area of Edinburgh, Scotland. This takes place after the Halo Legends episode Prototype. The UNSC The Heart of Midlothian is mentioned to be investigating Algolis based on the reports from the surviving civilians. Also, Ghost and his actions are mentioned. In the motion comic version, the Heart of Midlothian is being sent to investigate the attack based on a transmission from Algolis which features the prototype suit before cutting out. Unlike the short story's version of events, the ship has not yet met up with any survivors and the opening of the comic states that part of their mission is in fact to rescue any survivors.